Some good stuff going on around here! 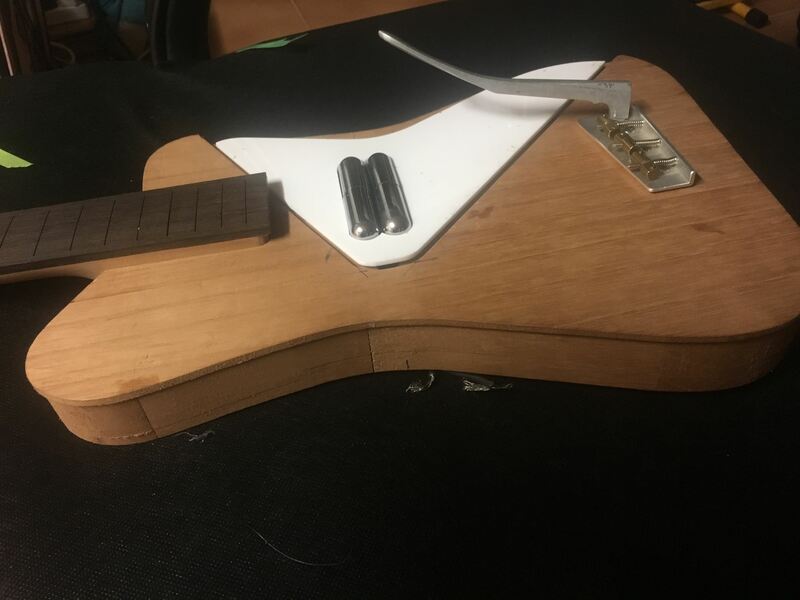 Epizootics, that is such a cool little thing you've made- I love the bridge and pickup, and that washer as mini pickguard also. The whole thing is sort of utilitarian & minimalist along with loads of personality. For some reason it's got me thinking of a Citröen 2CV. Oid, if you're reading this, what is that on the back of the headstock on your Melody Maker? Some kind of veneer patch? Kind of hard to know what I was looking at there. Delicate surgery, I hope you keep the pics coming. My evening's effort is this: Pickguard #2. The lipsticks are actual '60s Danos, which I've just realised means that paired together like this they'll function as a humbucker, as the magnets are reversed (apparently the reissues have magnets oriented in the same direction). 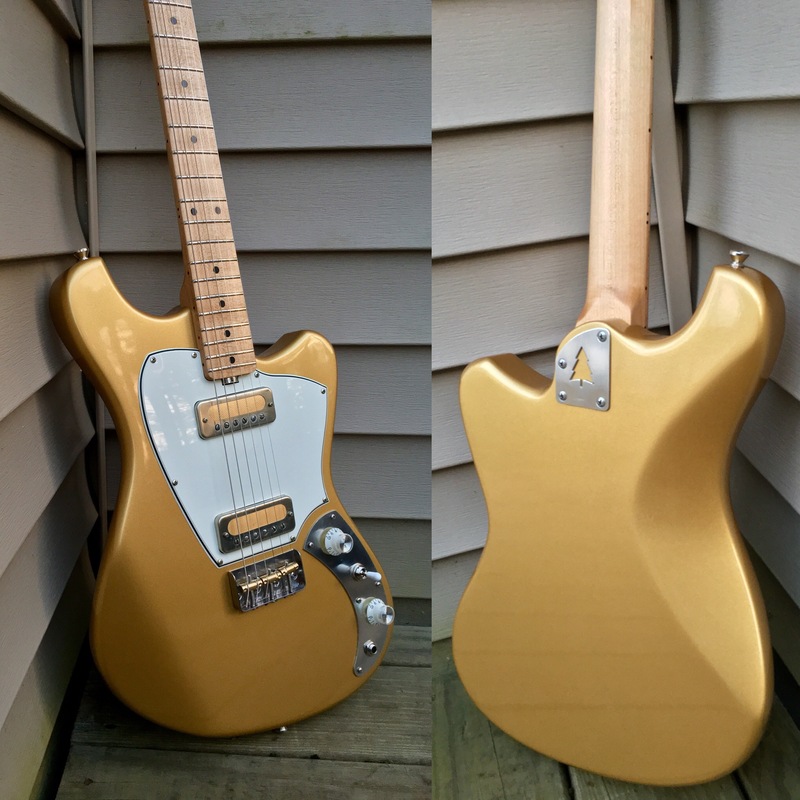 The plan is to have a switch to run one as a single or both in series- I'd have done it anyway no matter which way the magnets were oriented (lipsticks seem to be pretty quiet anyway with their fully shielded covers) but it looks like I'll have an actual humbucker, however much difference that will make. 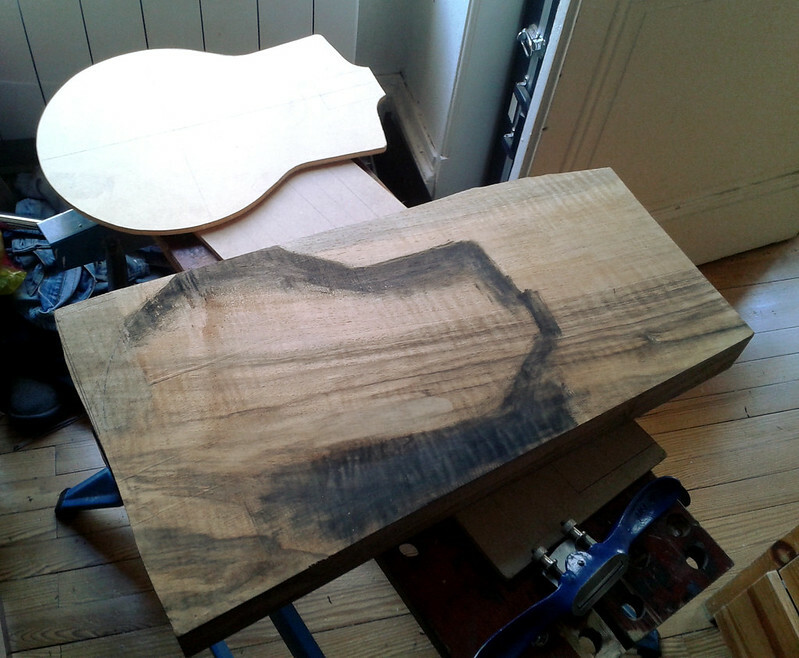 It is a patch inset into the neck, one of numerous repairs in that spot of the neck, head stock broke at least twice over the years. It is a mess I can not quite figure out how it has gotten so far off from where it should be since the original wood that remains seems lined up, but there is a 1/2" flat behind the nut before it goes into the angled back headstock. 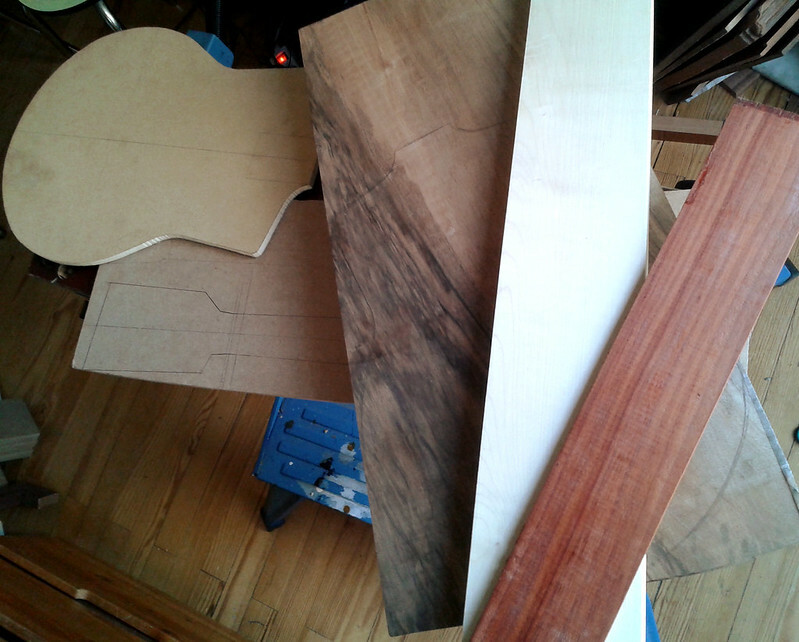 That whole bit will be cutout and redone after the heel is taken care of. A good chunk of the part of the neck is epoxy I think, it will be interesting to see what is in there when I cut it apart. There will be more pictures, gluing the split turned into an ordeal, endless glue problems and I did not get to glue it up until the next night before bed. Turned out well though, it will be invisible when all is said and done. 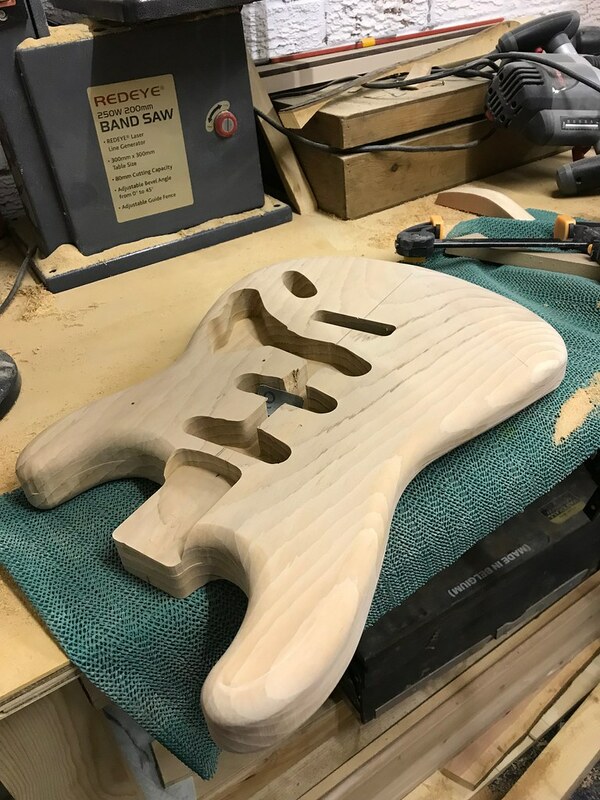 Did not have time to work on it this weekend, back to it this week/weekend if all goes well, not looking forward to fitting that joint, I really have no good idea on how to go about it, just have to slowly chisel wood away until it fits. Should have cut it as a tenon to get it fit and straight then opened it up into a dovetail from there, to many angles and curves! Suspect there is a fair chance I will have to recut the male portion at least once. Welp, it ended up being a bit different than the original mockups i posted a few pages back, but just got my del Sol prototype off the bench! I ended up ditching the tele control plate idea - it definitely didn't serve the design as well as i originally had hoped. I worked up my own plate design and had them water jet cut out of aluminum. First time for me having parts cut with a water jet - leaves a bit of a rough edge, but the aluminum files out easy. Also, the intonation on the Gotoh in-tune saddles is shockingly great and I would absolutely recommend them to anyone considering a 3 saddle bridge on a build. Cool idea on the neck plate! Your Del Sol is a fine design. Looks really good. Holy crap! That looks fantastic. 10/10, would rock. Cool beans Really tasteful, goldfoils on gold make complete sense! 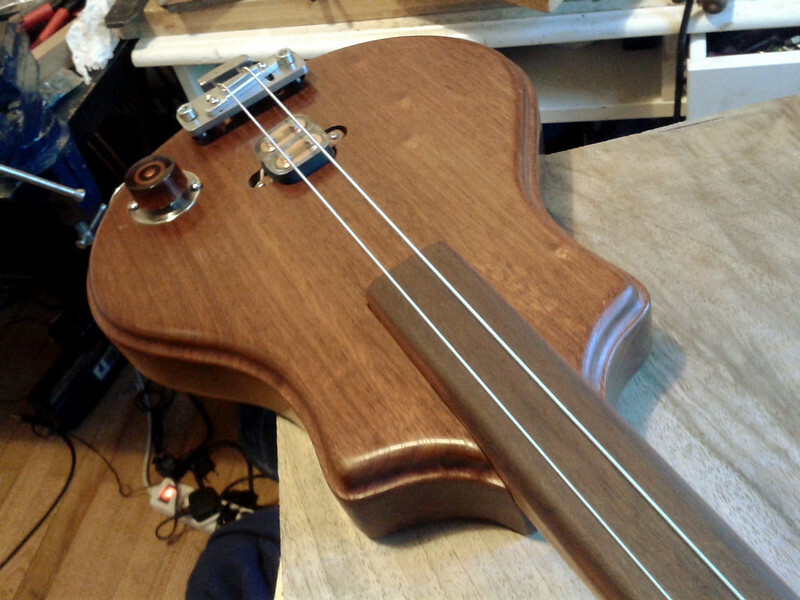 I made a quick sample of the two-string baritone today. I put a synth drone in the background not to stray too far off from being in tune...Erm...and it failed miserably, my sincere and complete apologies. I run it through a Vox amp simulation and a spring reverb. First part is played bass-style with my fingers, second part with a pick, and I used a 50 eurocent coin for the third part. It gives a good idea of how this thing sounds. Now I need to learn how to play the damned thing. 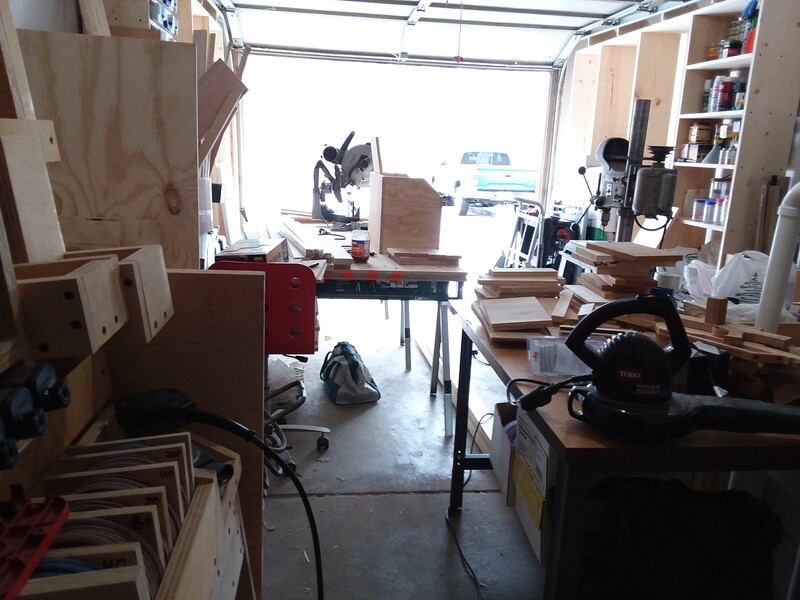 I feel like I have to defend my mess My garage/shop is currently intensely disorganized. I've only been showing the parts where I've been building to improve it. I'm getting there though! It'll be organized within the next month or so. After this past weekend's stomach sickness fucked me so bad, and seeing that it cost me a 4-day weekend, I put in for another 4-day weekend not this weekend, but the next, to make up for it. I'm hoping for some CRAZY progress by then. Or at least an apartment shelf or two If I remember, I'll get a picture of how bad it is right now. Thanks guys! I'm really happy with the way this one turned out. This was also my first real test of a new (to me) waterbased finish and I'm really pleased with the results. The sealer, paint and topcoats are all waterbased. For clear coats I used Crystalac Brite Tone finish, and so far it blows away all the other waterbased clears I've used. That is not a mess, that is cluttered at best. Things are clearly set down in places purposefully, nothing has collapsed, nothing is just tossed on the heap. That is a nice drill press. I'm a fairly organized person most of the time. There are a few tiny heaps, but things that'll get a proper place when all the shelving is finished. It's a 70's era Famco that my grandfather got when he was their traveling repair tech. He actually removed the serial number plate, and got a new one from the factory where he was based out of, and inscribed his name on it, which I really really like. The press is like 200 pounds, and the base, made for him by a seriously good professional welder they also staffed, is also like 200 pounds. The guy made the base out of like 3/8" stainless steel. The welds are gorgeous. The vertical drilling shaft needs a little lube, but that's not a big deal. That's quite a stand. Impressive. The mannequin works, too. Did a bit of Lascaux-style painting on it with china ink too.